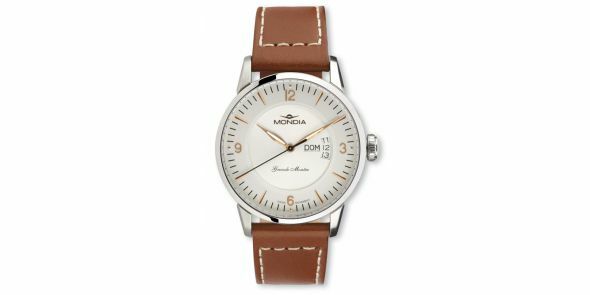 Mondia Grande Montre – Leather Wristwatch. 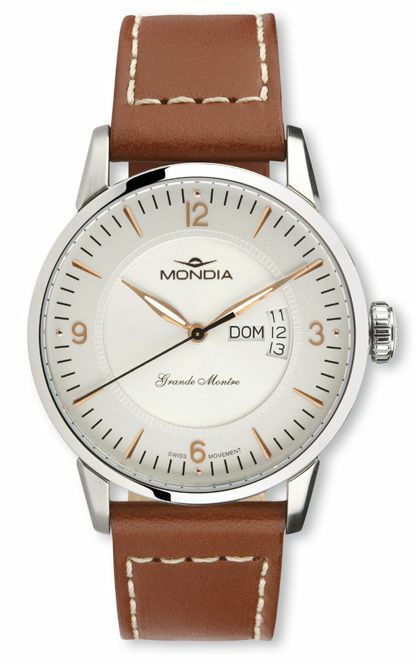 Mondia Grand Montre, quartz powered wristwatch. The watch is brand new with box and papers and comes with manufacturer warranty from the date of purchase. It is a large watch which is a simplistic and stylish watch as a time only format, which is the wristwatch in its simplest, yet most effective form. It is a well made, large and a stylish looking timepiece. It is based around a classical design with hours, minutes seconds and a day and date which is at the 3 position. The case is polished 316 L stainless steel with long lugs and large winding crown. It has got an anti reflective hardened mineral crystal with a steel case back secured by four screws. The watch is water resistant to 5 ATM. The dial is silver and plain recessed towards the middle with gold steel luminous filled hands and gold steel dial markings. The movement is a Swiss made Ronda Calibre 517 which is the one of the most popular movements for Swiss made quartz, day date watches and it is a movement known for its reliability and durability. It comes on a black leather strap with signed pin buckle. Width excluding crown is 42 mm, width including crown is 44 mm, lug to lug is 46 mm and thickness is 10 mm.